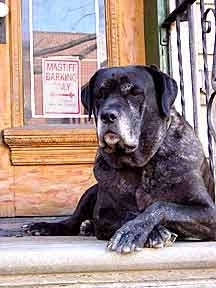 New York tails recently spoke with Yuffie, a five-year-old Neapolitan Bull Mastiff who runs her own on-line advice column when her owners, Robert Ipcar and Jane Landis, aren't using the computer. She is a frequent sight on the off-leash areas of Prospect Park, Brooklyn. New York Tails: Wow! You're Big! Yuffie: What did you expect, a Chihuahua? NYT: When did you start your advice column? Yuffie: My human, Bob Ipcar, used to write an advice column for a film crew trade magazine. That magazine folded, but the idea of the column survived. Only I write it now. NYT: What types of questions do you usually get? Yuffie: All kinds, I recently had a dog write in to ask me what to do after he ate his owners' cell phone by mistake and why we dogs feel an uncontrollable urge to jump into the melee of a dog pile. I even had one dog, "Annoyed Samoyed," write in and ask why humans collect our poop in little plastic bags. NYT: And? Why do they? Yuffie: What I've been able to deduce from the evening news is that the poop is shipped directly to some place called Washington. The humans here are always saying the humans there are full of it. NYT: In addition to your column, you're also a therapy dog at New York Methodist Hospital in Park Slope, visiting the geriatric and adult psychiatric units. Yuffie: Yes, but actually I go for the treats the nurses slip to me. NYT:Your family is quite a talented bunch, too. There on the wall is a beautiful collage painting by your human grandmother, your human father is a cinematographer who also runs smalltownbrooklyn.com, your human mother is a musician and environmental educator, your human sister Jenna is an artist and your other sister, Katie, is off at college studying science. Yuffie: If you say so. Yuffie: Excuse me, but you came here to interview me, right? NYT: Sorry. So where can people meet you, Yuffie? Yuffie: Well, now that the weather's heating up, me and my friends from FIDO (Fellowship for the Interests of Dogs and Their Owners in Brooklyn) will probably hit the Dog Beach. NYT: Great! And where can people read and submit questions to your column? Yuffie: You can definitely find me at http://www.exitfive.com/yuffie/.